It was Blue-Eyed Girl Lacquer’s 5th birthday a few days ago, on the 18th of May. As part of the celebrations, they’re releasing a new collection inspired by graffiti in and around Atlanta! In addition, there is going to be a big sale on items in the shop over the weekend – join the BEGLove Facebook group for a bit more information on that. For now, I have swatches of the new collection to share with you. There are some beauties, including a really fun glitterbomb! I’ll start off with my personal favourite, called The Voice of Many. I love turquoise, so this one was definitely a winner for me. As with the rest of the polishes in this Atlanta Graffiti collection, The Voice of Many was inspired by graffiti in Atlanta. This one was inspired by the Greg Mike Mural on Krog Street. Check out the mural – it’s so happy! And I can see where Julie got this lovely turquoise shade. This polish is described as a teal with bronze-green shifting aurora shimmer, copper sparking shimmers, and a blue/purple/orange shifting shimmer. I always think of darker shades when I think teal, so I’d describe this as turquoise, but that’s just semantics. The mix of shimmers is truly gorgeous and lately I can’t get enough of anything listing the aurora shimmers. I mean – tell me that isn’t gorgeous. You can’t! I really like the larger shimmers – I wonder when it stops being shimmer and starts being a microflakie? Either way, it’s beautiful! In these photographs, I am showing 2 coats of The Voice of Many with top coat. The formula was fantastic, really opaque and easy to apply. Julie noted that she’s reformulated her polishes with this release so that they will not be as thick, and I’m a fan. I tend to find a lot of indie polishes on the thicker side – good formulas, but my personal preference often requires that I add a little thinner. The formula on all of these was fantastic just as it was (and if you prefer a thicker formula, don’t worry – these are NOT too thin. They’re just right and apply beautifully). Next up, we have a glorious bright pink, Psychedelic Whisky. My camera had a really hard time with this pink, and my images are also looking pretty different from device to device and even in different image viewers – but in reality, this polish is a pure bright and vibrant pink. In many cases my bottle macros (above with the polish name) tend to be less colour accurate due to lighting so close up to the bottle, but in this case I think that the bottle macro is actually more true to the real-life colour of the polish. I would also trust the colour in the nail macro more than the colour seen in the more zoomed out full manicure images. This polish is described as a hot fuchsia/pink with aqua sparking shimmers and purple/copper/green shifting aurora shimmer. It’s basically the bright, summery pink version of the turquoise polish above. 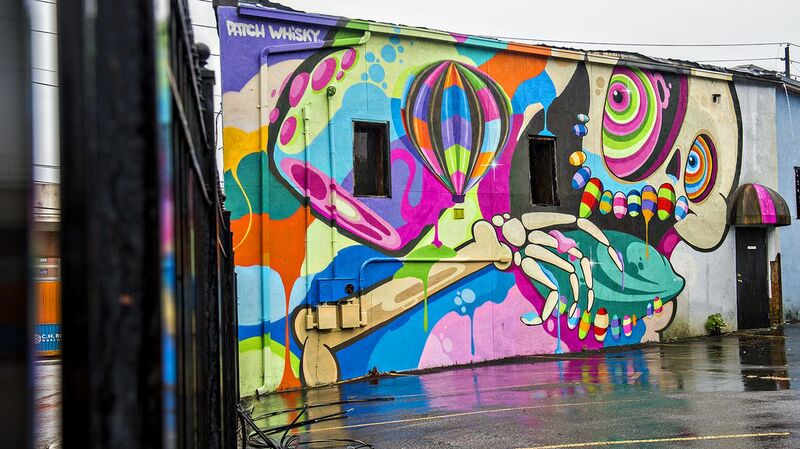 Psychedelic Whisky was inspired by the graffiti at the Blue Complex on Decatur Street by Patch Whisky. I love the style of this artwork – so many bright colours! Once again, that mix of shimmers is phenomenal. I can definitely see some of the aqua and purple coming through. Again, I am showing 2 coats with top coat. I’m actually trying to put together a live swatch video to share with you, but unfortunately didn’t have it ready just yet – hopefully next week. For now, though, you can see a sneak peek I’ve posted featuring a live swatch of Psychedelic Whisky in this Instagram post. As you can see, it’s really opaque, and has an amazing formula that applies easily and smoothly. What would a collection like the Atlanta Graffiti one be without a fun glitter topper? Next up is a wonderful glitter bomb that looks amazing over these polishes or just about any others! The text disappears a little with everything going on in that bottle macro, but this polish is called Summerhill Heart. Here I am showing Summerhill Heart over Psychedelic Whiskey. This polish is described as a clear glitter topper with a focus on black glitters with multi-coloured accents. It is a wonderful mix, with everything from yellow and turquoise hexes to the occasional pink heart, with the black glitters in various sizes to bring it all together. In these shots, I am showing just one coat of Summerhill Heart. The glitter is really well distributed throughout the base and applies easily with no fishing required – including the larger glitters. I like to apply glitter toppers like this one with care to get a good distribution of glitters and sizes, and this polish made it easy to achieve that. Summerhill Heart was inspired by the Dr Dax mural in Summerhill. This is another incredibly vibrant artwork – no wonder Julie used so many different glitters in this polish. This glitter topper looks amazing over pink, but I wanted to show it over The Voice of Many as well so you could see that it looks equally amazing over turquoise. It is such a fun polish that could go with a variety of different bases! Finally for today, we have Edgewood Garage. For this one, my bottle macro came out lighter than the actual polish. Look at my swatches below for a more accurate representation of the polish. Edgewood Garage is described as a grape jelly packed with red microflakies and cyan/indigo shifting aurora shimmer. This one is quite different from the others in the collection – it’s dark and vampy, and the shimmer has a different effect than that seen in Psychedelic Whisky and The Voice of Many. Here I am showing 2 coats of Edgewood Garage with top coat. Because of the jelly nature of the base, this one had a different, squishier effect than the others in the collection, but was still nice and opaque in 2 coats. I’ve actually been wearing this polish all week while I’ve been at a conference, and I’ve been loving it and I’ve had great wear! Finally, East ATL Rainbow is also a part of the Atlanta Graffiti collection. I’ve already shared swatches of this amazing, vibrant yellow since it saw an early release at the Atlanta Indie Shop. It is a gorgeous polish so check out my swatches of it – and do notice that East ATL Rainbow is an exclusive polish so you will need to join the BEGLove group to be able to purchase that one. The rest will all be available on the Blue-Eyed Girl Lacquer site from 5/25 at 3:30 pm edt.